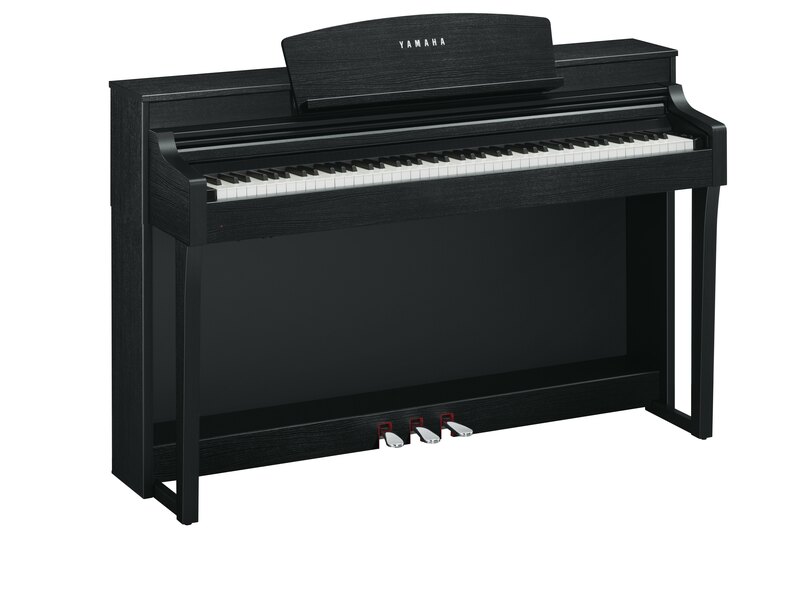 The CSP (Clavinova Smart Pianist) is Yamaha’s latest Clavinova. Using the Smart Pianist App along with your CSP Clavinova the possibilities are endless. The Smart Pianist App is a combination of some of Yamaha’s already popular and useful apps (Chord Tracker, Note Star, Audio Recorder & TF Stage Mix). There are 2 models in the CSP line, the CSP-150 and the CSP-170. Current finish options are Matt Black and Polished Ebony. 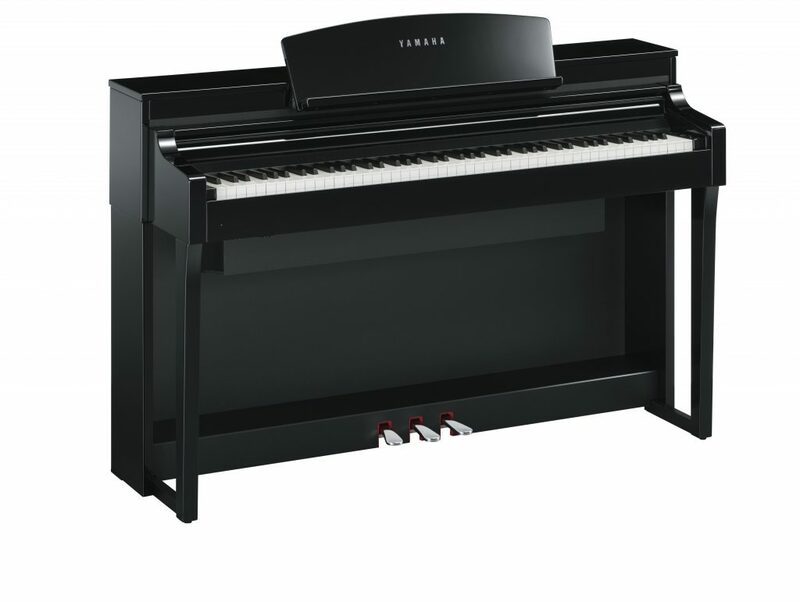 The CSP-150 comes with a GH3X (Graded Hammer 3 sensor with escapement) keyboard action with synthetic ebony and ivory keytops. 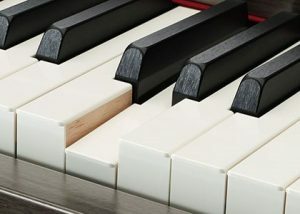 The CSP-170 comes with a NWX (natural wood with escapement) keyboard action also with synthetic ebony and ivory keytops. Both pianos come with the CFX and the Bösendorfer piano samples as well as streaming lights, audio to score, Piano Room, Voices, Styles & Songs. The CSP-150 has a 1-way speaker system (16cm) x2 and the CSP-170 has a 2-way speaker system (16cm + 8cm) x 2. Likewise the CSP-150 has 30W x2 amplification and the CSP-170 has (45W + 45W) x2 amplification. The CSP music desk has conveniently located a USB port for iOS (compatible with iOS 10 or later) on the right side of the rack and a USB to Host for Android on the left side of the rack. All song content will be loaded via the app. The Clavinova CSP’s teach anyone how to play their favorite songs, right out of their music library. Stream Lights, exclusive to the CSP, move towards each key showing users which notes to play and when to play them. 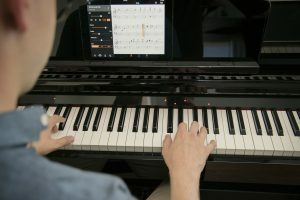 Users can adjust the speed at which they’re learning, as well as the difficulty of the piano arrangement as they improve. The Smart Pianist app’s Audio to Score feature scans the songs in the music library on your smart device. It analyzes the audio, and then produces a piano score that can be customized to your liking. Change the score to be more rhythmically complex to challenge yourself, or to match the feel of the song. The Stream Lights on the CSP will intuitively light up above the correct keys to play, and will also show you when to play them. A chord chart is also produced to that you can follow along with your own voicings, if that is your preferred method of reading. If a chord or the tempo is analyzed incorrectly, quick and easy adjustments can be made. 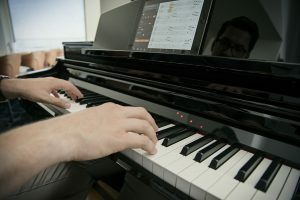 The chord information can even be converted to MIDI, allowing your CSP Clavinova to play back the chords to the song using the accompaniment Style of your choosing. Never before has technology made it so easy to learn how to play your favorite songs! Stream Lights show you which notes to play and when to play them, with four LED lights above each key. Lights move towards the keys to show the timing of the next note in the song. Stream Lights are useful when you’re in Guide Mode, where a midi song displays the next note and waits for you to play it before proceeding. But they’re also great when used with the Audio to Score feature of the CSP, with the user’s own library of audio song files. While Audio to Score doesn’t work with Guide Mode (which waits for you), the tempo of audio songs can be slowed down to learn at a comfortable pace as you progress. Tablet-based user interface takes advantage of smart devices like an iPad or Android tablet. This helps keep the elegant, traditional look of a classic piano. All of the internal features are accessed via a high-quality touch screen. The 1/4″ microphone input allows you to connect a microphone so that you can sing along while you play. You’ll hear your voice through the instrument’s speaker system and anything the microphone picks up can also be recorded to USB audio. Pair this feature with the You Are the Artist series sheet music and MIDI files, and you’ll be the star of your own show! With Vocal Harmony 2 you can sing along with three of your own virtual background vocalists. Vocal Harmony 2 takes that a step further with new pitch recognition and stability controls. Connect your portable music player to the Aux Line Input jack and enable Melody Suppressor to isolate and reduce the volume of the lead vocal or lead melody for the song you’re listening to. This leaves room for you to sing the lead, or play the melody along with your favorite tracks. Audio time stretch and pitch shift allows you to change the key or tempo of your audio song playback to suit your needs. The powerful pitch shift feature lets you change the key of your audio song without changing the tempo. If you want to change the tempo, you can use the time stretch feature to slow down or speed up the tempo without changing the pitch. Integration with wireless device is fantastic.